You know what’s kinda sad? Listening to the radio this morning NPR was doing some snippets talking to various people who serve (or have served) here in the US and I was suddenly struck at how “Memorial Day” had no real meaning to me other than “it’s a 3 day weekend”. I can’t blame the wash of ridiculous food holidays that now exist and fill every single day, I can’t blame commercials where hot dogs march on a grill waiving flags (this might not exist but just be a dream I had), I can only blame my own self-absorption into my own affairs. Which shouldn’t be the case. My Dad served. Even though he doesn’t talk about it I know he did. My Dad also likes a stiff drink, or half a dozen beers (depends on the day), so this weekend I am being mindful of what the holiday means. I’m also offering up some suggestions for all the dads, the moms, the relatives, friends and those we don’t know, and for all of us taking the time to sit back and enjoy a drink with one another as we take some time off. Me and Beer are not what you would call best friends. We spy each other from across the room and keep a cool distance. Once and awhile we’re forced to spend time together. Usually out of desperation. But before you Beer Lovers out there delete me from your feedly account, I will say that I can be turned sometimes. For example, last time I was in San Francisco I had a Nautilus Saison. It was really good. And if I’m out at a place that only is doing beer, I won’t be that a-hole not drinking. Usually I ask for a sour beer, and more than likely they have one. What I really like in a Beer Experience is something luxurious. I take the beer cocktail movement seriously. Amazing things have been created and imbibed by myself. However, I haven’t quite knocked one out of the park yet to share on here. What have I done with beer lately though? Make a damn float. 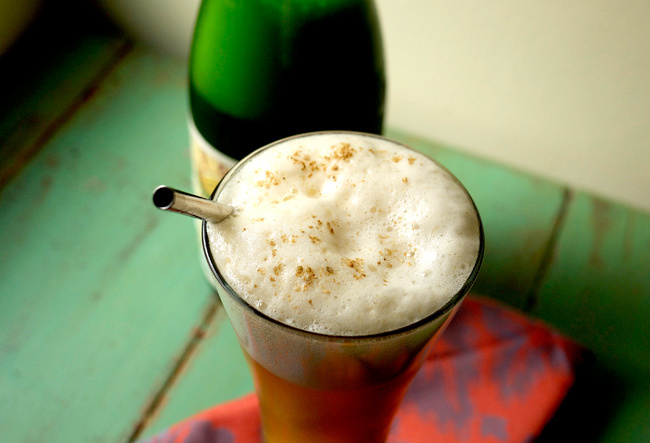 A luxurious Saison float with some homemade sorbet. Oh yes…. First, you cannot take any old ice cream/gelato/sorbet and stick it with any old Pilsner/IPA/Double Chocolate Stout. Oh wait.You totally can stick that Double Chocolate Stout with a lot of flavors. But the point is that when you are going to create a beer float, you need to look at it as you are crafting a cocktail. The flavors should compliment each other, have a good body together, introduce new flavors into the party. Also, you shouldn’t be afraid to add some enhancers such as bitters and herbs. Again, like making a cocktail. After I tried that Saison I knew that the profile of that type of beer would work really well with some seasonal fruit sorbets. I like making sorbets. But usually I make alcoholic sorbets. This time I would leave that part out, focus what is in season and what would pair well with the beer. Peaches were overcrowding the fruit basket, so they needed to go. The last of my basil was also starting to look a tad sad so I figured these two would make a great pair for a sorbet. I made a small batch, knowing that freezer space is limited in my house right now so I needed this guy in and out quick. After the batch was done, taste tests were conducted with a variety of Saisons and the winning combo was the Foret Organic Saison. The pairing was great, but what put it over the top and rounded out the float was a sprinkling of freshly ground Coriander . Have you guys ever smelled the stuff freshly ground?! It has the most striking lime aroma. It was the extra brightness that this float needed to make it exceptional. 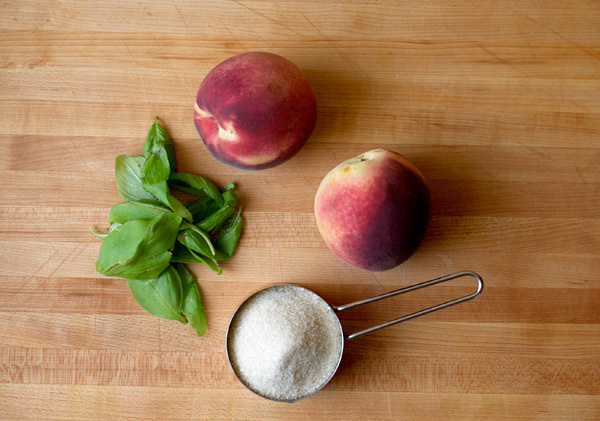 Bring the sugar, water, and basil to a boil in a small pot. Gently simmer 10 minutes, until the sugar is completely dissolved. Remove from the heat, cover and let steep for one hour. 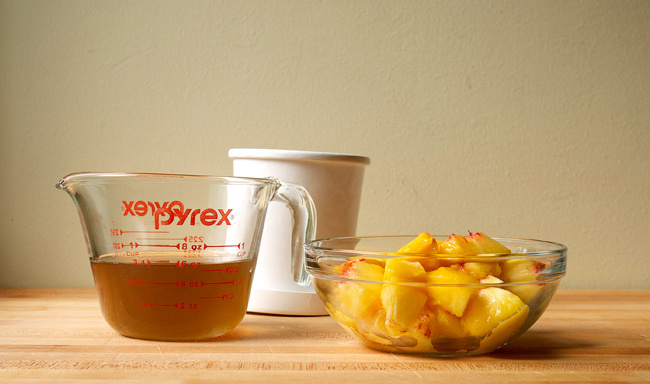 Purée the syrup with the peaches until smooth in a food processor. Chill mixture in the fridge for at least an hour. Transfer the mixture to an ice cream maker. I found that this small batch took only about 10 minutes to come together. Depending on temp and humidity in your kitchen, could take a few minutes more. 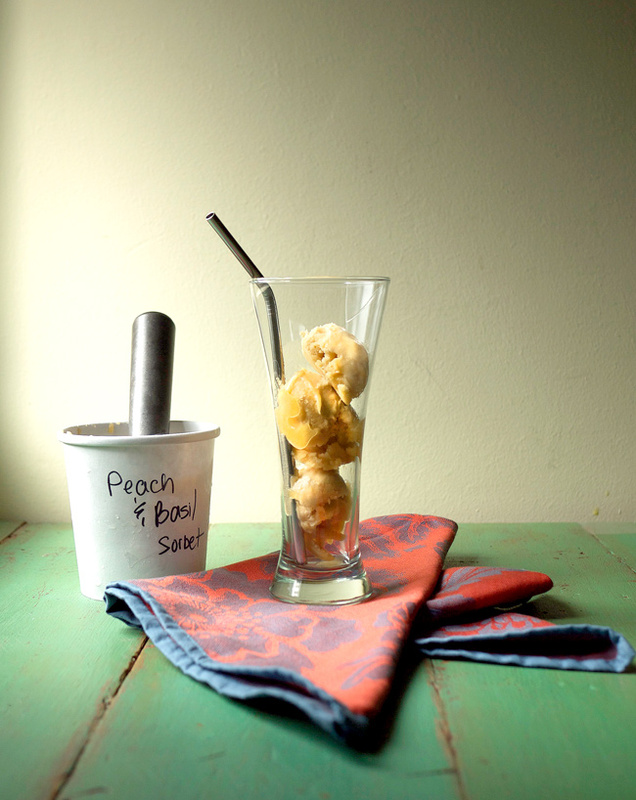 In a pilsner glass, add the scoops of sorbet. Pour the Saison over the scoops and add a pinch of the coriander to the foam. Add a straw if you like. The ground coriander has vivid lime notes that bring out the citrus from the Saison. Dry start with a sweet finish. The peach and basil are soft in the background on initial sip, until that is, you get a chunk in your straw, at which point you get this potent herbal fruit flavor. This drink is SO light you can drink multiples without feeling too heavy. It’s even delicious with food (I had a Cuban sandwich and it was a super match!). Check out the Boozy Dessert Round Up on Clinton Kelly for this recipe from me and more!